Touch. Feel. Imagine. Discover. 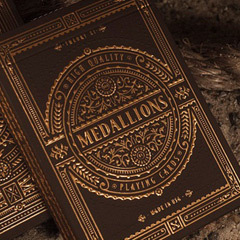 Medallion Playing Cards. A blend of sheer elegance and striking beauty. A timeless object infused with supreme luxury from the Victorian era. After 18 months of discovery, we dug up the perfect recipe. We're proud to announce our newest treasure: Medallions. Ultra-lux playing cards in deep brown and gold foil. 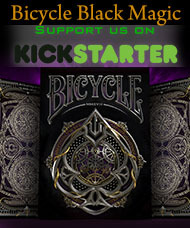 We sought after the highest quality materials and produced one of our finest creations. The deep brown tuck case features the new ultra-lux matte paper found on our Red Monarchs. It's covered top to bottom in a striking gold foil. The design is accented by embossed stitch elements in the front and sealed with our signature precision printed gold foil sticker seal. It doesn't stop there. We used metallic ink on the back and hand-illustrated custom court cards.